Figure 1. 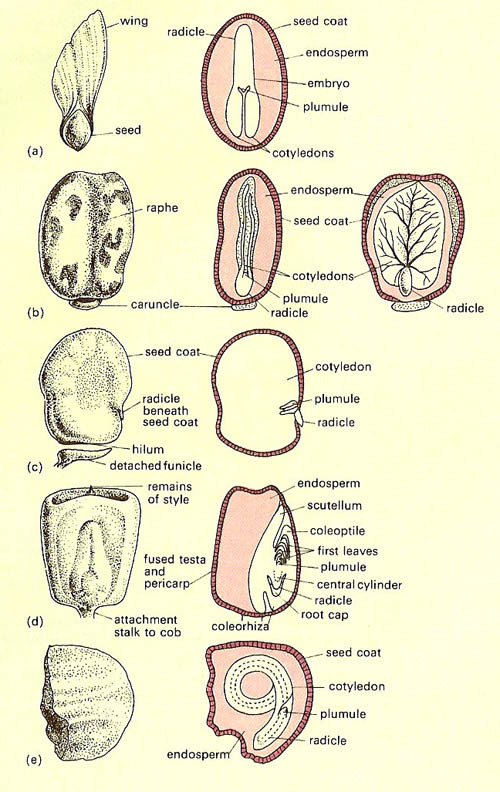 Representative types of seed: side and sectioned views: (a) Winged endospermic seed of pine (Pine); (b) endospermic castor oil seed (Ricinus communis; (c) non-endospermic broad bean seed (Vicia faba); (d) endospermic "seed" of corn (maize; Zea mays) (botanically this is really a fruit but the fruit wall is thin and fused to the seed coat); (e) endospermic seed of the onion (Allium cepa). Figure 2. Lime and sycamore seeds, dispersed by the wind. Figure 3. Fruit, and their seeds, that are dispersed by the wind. Figure 4. 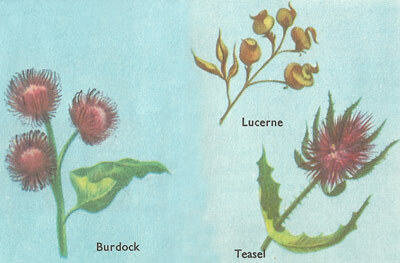 The fruit of burdock, lucerne, and teasel. Figure 5. The fruit of the grape, hawthorn, currant, cherry, and blackberry. Figure 6. Dispersal of coconuts by ocean currents. Figure 7. A variety of explosive fruits. A seed is the mature reproductive body of angiosperms and gymnosperms. Seeds also represents a resting stage which enables plants to survive through unfavorable conditions. The germination period varies widely from plant to plant. Embryo. This is the essential living part of the seed. It consists of a radicle, which gives rise to the root, and a plumule, the growing part of a young shoot; the part containing these two is called the hypocotyl. One or two seed leaves, or cotyledons, grow out from the hypocotyl and may or may not be taken above the ground during germination. Plants that produce one seed leaf are called monocotyledons and those that produce two, dicotyledons. The cotyledons may function, after germination, as leaves, or they may (in seeds like the bean) contain the food-store. Food-store. This is the reserve of food on which supplies the embryo and growing plant until it is able to make its own food. The food-store may be in the cotyledons or in a part of the seed called the endosperm. It is this stored food which is of nutritional value (see nutrition) to humans and other animals. Testa or seed-coat. This the tough protective outer covering the seed. It often has outgrowths which help in dispersal of the seed. Flowering plants produce their seeds inside a fruit, but the seeds of conifers like naked on the scales of the cone. Dispersal of seeds is usually by wind, animals, or water and the form of seeds is often adapted to a specific means of dispersal. Carriage by the wind is the most efficient mode of dispersal of all, and a great variety of plant have fruits adapted in this way. All of them have wings or parachutes to give them buoyancy in the air. 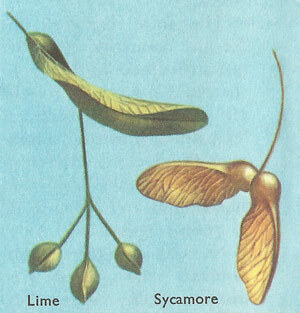 The winged fruits, like of the lime and sycamore trees, are usually carried only a little way, just far enough to be out of the shade of the parent tree, but a strong gale may transport them a few miles. It is the very small fruits with feathery parachutes that really travel; those of the poplar and dandelion can often be seen floating in the air, and they ay be carried hundreds of miles. We often see plants growing on the side of old houses, or on high walls. Many of these will be found to have wind-borne seeds. Seeds contained within edible fruit – that is, 'fruit' in the sense that most of us use the word – are dispersed by animals. The seeds have such thick, hard coats that they resist the digestive juices of the fruit-eating animals and pass out with their excrement. 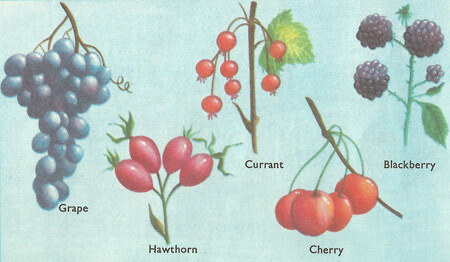 A bird may carry the seeds of blackberry or hawthorn a great distance in this way. When a new island is form in the Pacific or Indian Ocean by volcanic eruptions or other means, one of the first plants to appear on it is the coconut palm. The fruit of this tree sometimes falls directly into the sea, or it may be carried away by a high tide. The thick husk that surrounds the seed or nut is impregnated with air, and so the fruit floats in its protective covering until it is stranded, perhaps hundreds of miles away on some other newly-formed island. There are other plants with sea-borne fruits; some of these may fall from trees growing on the coast of the Gulf of Mexico and get carried by the Gulf Stream as far as Norway. with a fruit that dries and contracts until it is under tension, like a spring. When the tension reaches a certain point the fruit explodes, hurling the seeds out. The champion in this class is the Central American sandbox tree, Hura crepitans. Dispersal of this kind can only carry the seed a few feet and is not very effective. In the wild geranium or cranesbill the five carpels spring upward from the base and scatter the seed. The scientific name of the yellow balsam is Impatiens noli-tangere, which means 'impatient, don't touch'. The squirting cucumber (Ecballium elaterium) is a plant of the Mediterranean region with fruit like small cucumbers. When these are ripe they burst away from the stalk, flinging out the seeds as they do so.